We thought we knew kale chips. We’re The Chalkboard, for goodness sake. But then…we met Chef Jeff Mahin. As the chef-owner our next-level pizza neighbor Stella Barra and organic comfort food heaven M Street Kitchen, we’re pretty confident this super-foodie could put an inventive spin on just about anything. These nut butter-coated kale chips are out of this world. Not only do they taste ridiculously amazing, they’re chock-full of healthy fats, anti-inflammatory vitamins, and magnesium. – their one of this chefs go-to foods to prep for both his east and west coast Chef’s Cycle for Share Our Strength, an organization which raises funds to make childhood hunger in America a thing of the past. Get out your baking sheets, roll up your sleeves, and get crunching – your next snack attack won’t know what hit it. Individually remove the leaves of the purple kale. On the bigger leaves, also remove the stem. Wash with cold water and dry completely. Place the cashew butter mix into a large bowl. Place the kale into the large bowl and coat each of the leaves. Place a cooling rack onto a sheet pan, spray with oil spray. 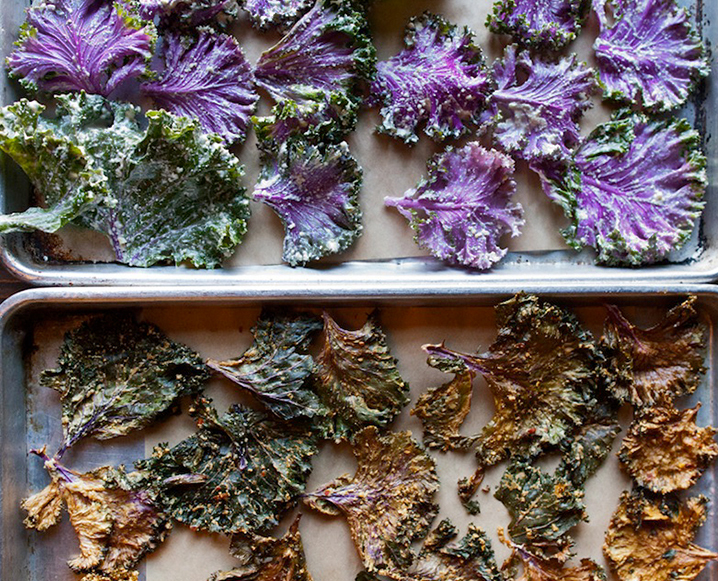 Lay the coated kale over the cooling rack (do not stack on each other). Place in oven for 1 hour (or until crisp). Remove and place in air tight container to store. Place the cashews and water into a blender, blend until smooth. In a large bowl, fold the spice mix into the cashew butter until well incorporated. Remove from bowl and reserve for coating in a small plastic container. Share the post "Kale Chips + Cashew Butter: The Crunchy Recipe That’s Too Good To Be True"
Kale chips are the only way to get my son to eat some rich greens…can’t wait to try this recipe! My better half can’t eat cashews- hope to try these with almond butter, which is easy enough to make. The possibilities of other nuts – macadamias, anyone?